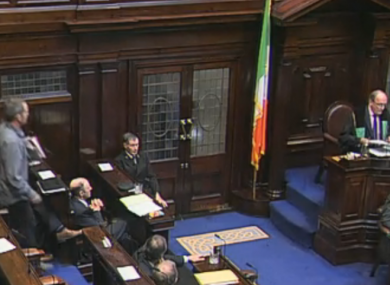 Richard Boyd-Barrett is asked to leave the chamber by Ceann Comhairle Seán Barrett – the first ejection of the 31st Dáil. Richard Boyd-Barrett (left) leaves the Dáil chamber after being ordered to do so by Ceann Comhairle Seán Barrett. RICHARD BOYD-BARRETT has become the first TD to be asked to leave the Dáil by its new Ceann Comhairle, Seán Barrett, after the two deputies exchanged heated words in the chamber this afternoon. The People Before Profit TD was asked to leave after refusing to withdraw a remark made off-microphone about Barrett’s handling of Dáil procedures, alleging that he was being unfairly singled out for more strict application of the Dáil’s rules than other TDs. The request for Boyd-Barrett to leave came minutes after heated words were changed between the two, when the Ceann Comhairle ordered Boyd-Barrett to stop asking questions unrelated to the visit of Barack Obama, which was being discussed at that time. Boyd-Barrett – who shares his Dún Laoghaire constituency with Barrett – has persistently being on the receiving end of rebukes from Barrett in the chair, over the former’s attempts to deviate from the agreed agenda in asking questions of government ministers. Email “Boyd-Barrett becomes first TD kicked out of new Dáil”. Feedback on “Boyd-Barrett becomes first TD kicked out of new Dáil”.